When it comes to gutter cleaning, our company is the first choice of hundreds of commercial and domestic clients in Chiswick and the surrounding boroughs. This is hardly surprising as we never fail to deliver spectacular results at budget-friendly rates, anyone can afford. The service stands out with unprecedented efficiency as we use advanced equipment and work with referenced, experienced and insured staff only. You can book us any day you find suitable as we are available Monday through Sunday, even at a moment’s notice. Make the right decision and contact our call centre to request your no-obligation quote now! 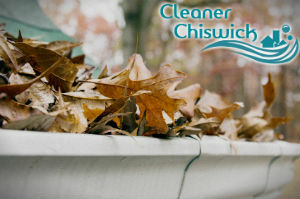 Putting off cleaning your gutter is never a good idea as moss, sticks, and leaves tend to accumulate over time, preventing the proper functioning of your troughs. Some of the widespread issues associated with blocked and poorly maintained gutters and downpipes include overflows, leaks, vermin infestation, and wall discolouration, among others. Booking our professional gutter cleaning is the surest way to spare yourself the trouble and expenses in the long run. Our state-of-the-art telescopic poles are connected to a powerful wet/dry vacuuming machine. A small camera is attached to the pole’s end so that we can see inside the gutters and the downpipes. Our operatives rarely resort to using scaffolding and ladders as the poles can extend to up to twelve metres. Creating powerful suction, the vacuum cleaners can extract all compressed debris from your gutters and pipes, allowing them to function at their best. Should we encounter any damages to your gutters and downpipes, we will report them immediately so that you can take actions and fix the issues. 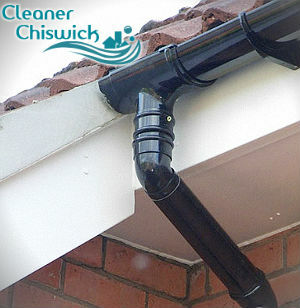 Being the number-one gutter cleaning provider in W4, we never disappoint our customers. Moreover, we can take pictures of the final results, using the aforementioned camera. Appointments can be scheduled via our online booking form or our telephone line!